Approaching its fourth year of inception, iBRIDGES is a collaborative initiative designed to empower the worldwide high-tech entrepreneurial community, focused on those of Iranian descent, to exchange knowledge, best practices, and innovative thinking. Last year, I was lucky enough to participate in iBRIDGE Berlin. It was a humbling experience presenting at a conference that included some of the brightest minds in the technology industry. I highlighted my experience in this blog post, but I am even more honored and excited to participate in this year’s conference in Barcelona. Here is why! iBRIDGE Barcelona will feature a great line up of speakers with leaders from Flipagram, Google, IBM, Intel, Snapchat and other globally recognized brands, as well as educational, research, financial and investor institutions such as 500 Startups, NASA, Skoll Foundation and many others. Over 1,000 participants are expected to attend iBRIDGE Barcelona this December 8-10. The event will also celebrate the momentum of the promising startup ecosystems, as well as the contribution that established global brands continue to make which are all helping to build a clear pathway to a global innovation economy. I am looking forward to hearing from the esteemed speakers and to get the opportunity to discuss the topics that are shaping our world and how we live with some of the very individuals who are influencing them, while meeting the young entrepreneurs joining the conference from around the globe, for all the same reasons and hearing their innovative ideas that will have a global impact on our future. 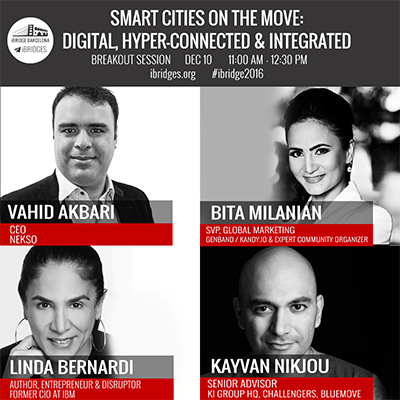 This year, I will be moderating the Smart Cities On The Move: Digital, Hyper-Connected & Integrated session where I have the great honor of presenting with Author, Entrepreneur and Disruptor, Linda Bernardi; CEO of Nekso.io, Vahid Akbari; and Senior Advisor of KI Group HQ, Challengers, Bluemove, Kayvan Nikjou. Our panel is going to touch on everything from the role of the Internet of Things (IoT), Cognitive, Artificial Intelligence (AI), Machine Learning, Deep Learning and other innovations as we think through the future of smarter cities to taking a look at how the importance of testing markets played a critical role in the success of innovative new apps like Nekso. We will also take a look at the growing importance of the world of transportation and the impact it will have from a consumer and automotive perspective on Smart Cities. All of these topics are so relevant to the work that we are doing at Kandy.io, GENBAND’s Communication Platform as a Service, because we are playing a critical role in incorporating the human element into all of this new technology. For example, at Kandy we are the Human Connection for IoT. The Kandy IoT platform provides Application Programming Interfaces (APIs), Software Development Kits (SDKs) and frameworks to various IoT endpoints. Kandy also provides messaging APIs to different messaging platforms, whether Native or In-App Messaging support on different consumer devices, and provides a framework to IoT Bots and Cognitive platforms like IBM Watson. Kandy SDKs can also be embedded on IoT devices for communications. 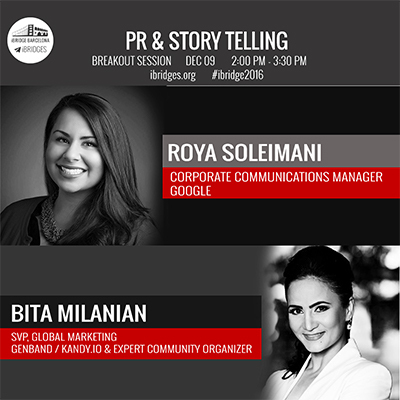 In addition to the Smart City panel, I am also participating in another great session on PR & Storytelling with Roya Soleimani, Corporate Communications Manager, Social Impact at Google. It will be a lot of fun sharing success stories and case studies together with my dear friend Roya, for the audience to take away lessons learned from our everyday experiences in this arena and how they have helped us grow the business units we manage and support. Now you see why I am so passionate about what the future holds from a technology perspective and the role my company will play! This year’s iBRIDGE global meetup is appropriately taking place at a city that also hosts the annual Mobile World Congress, one of the most important events in our industry and one where my company has a major presence each year. I am so looking forward to this year’s conference and the discussions that will take place with the entrepreneurs and innovators who are driving the strategies of the technologies that we are so dependent upon today and will be even more so in the future. I hope to see you in Barcelona in December and again in February!